Synopsis: A father and son, both coroners, are pulled into a complex mystery while attempting to identify the body of a young woman, who was apparently harboring dark secrets. 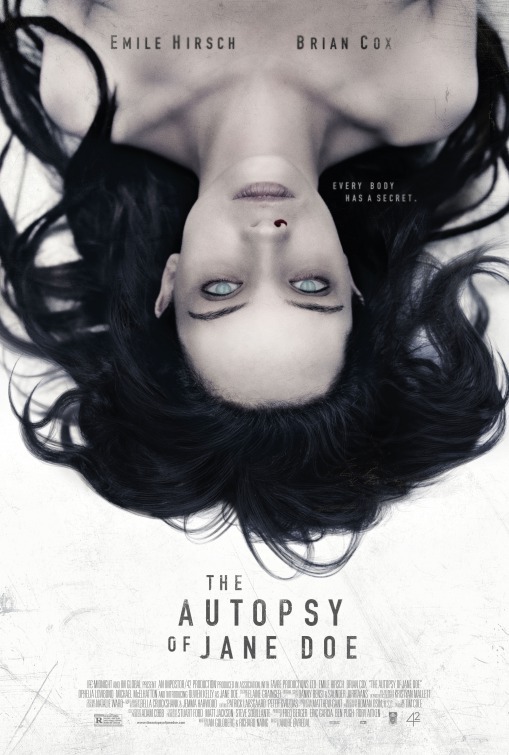 Review: Based on the recommendation of a trusted source, I fired up The Autopsy of Jane Doe a while back on a cold evening when I had the apartment to myself. I turned off all the lights and settled in to see if the good buzz from my friend was real. 86 minutes later the lights had been turned on (and stayed on for the better part of the night) and my nerves were downright rattled. A rare jewel in a sometimes-tarnished crown of low-budget horror films, The Autopsy of Jane Doe has some smarts behind it, not to mention a fair share of goosebump-inducing passages. Proving once again why you should just close up shop when the day is done, a father-son set of coroners answer a late-night call from the police to start an autopsy of a young woman found buried in a neighboring town. Though she’s been hidden in the dirt for an indeterminate amount of time, her alabaster skin doesn’t show any decay nor is there any sign of immediate trauma. As the two men work into the night in their shadowy underground funeral home, they begin to believe not only that there’s spooky forces at play surrounding Jane Doe…but that the body might not be dead enough for burial just yet. As the family members plunged into a frightful night of terror, Brian Cox (Pixels) and Emile Hirsch (Lone Survivor) play well off each other, mostly because they treat the material with the right amount of growing warines. The father is more trusting of history and science while the son is willing to suspend his disbelief and consider that what’s happening to this body can’t be explained away by documented medical cases. Writers Ian Goldberg and Richard Naing’s plot will keep you guessing and their script is aided by André Øvredal’s measured direction. Special mention must be made to the actress playing Jane Doe (Olwen Kelly) who has to do a helluva lot lying full naked on a cold metal slab. The final 1/3 of the movie is loads of fun with many developments happening in quick succession. You’ll never get too far ahead of the characters, thereby enjoying each twist as it develops in front of you. There’s a fair amount of autopsy gore but the other violence is handled with just the right quantity of blood and guts. I hesitate to call the film classy because then we get into a different type of horror film that this one just doesn’t have any aspiration to be. It knows what it is and is highly effective in its mission to freak you out. Watch it alone if you must but try and rope a friend in to share the love.